Has Canon's PowerShot G-series finally met its match? The Nikon Coolpix P7000 was originally launched just over a year ago in order to compete with Canon's revered PowerShot G-series, matching its main rival - the Canon PowerShot G12 - in terms of key specifications, full manual control and premium build quality. It also proved itself capable of producing beautiful images straight out of the camera. Where it fell short, however, was in its handling, delivering a sluggish shooting experience. The new model doesn't appear to have had much of its fundamental hardware altered in comparison to its ancestor: the Nikon Coolpix P7100 still packs the same 10.2MP CCD, a 7.1x optical zoom lens, which offers an equivalent focal range of 28-200mm on a 35mm camera, and vibration reduction (VR). Also unchanged is the 720p HD movie mode, which is starting to look a little outdated in comparison with a lot of the lower-spec compact cameras out there that now offer Full HD filming capability. Nonetheless, the Nikon Coolpix P7100 offers an impressive range of advanced technologies that improve upon the P7000's specifications, not least the addition of the previously-mentioned, more flexible articulated screen (albeit of the same size and resolution). 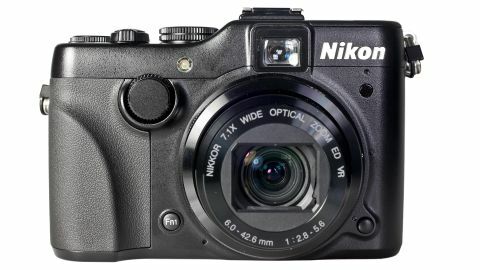 There's also a new front control dial for improved handling and AE lock when shooting movies, plus some new additions to the camera's effects options and claimed enhancements to the Nikon Coolpix P7100's responsiveness and image quality. But does Nikon's latest launch live up to the manufacturer's claims?